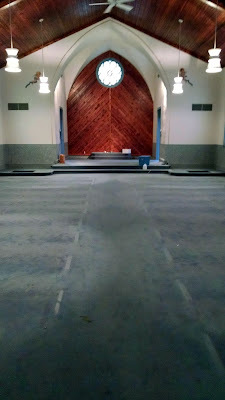 Mainly because we took everything out of the St. Ann Church. Did you hear there might be flooding? 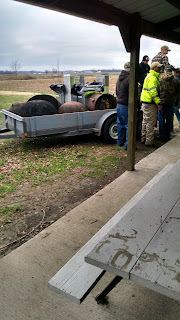 Don't worry...we saved the duck booya kettles, too! And God Said, "You Got Some Splainin' To Do...."
This occurred at Our Lady Of The Miraculous Medal Parish Church in Binan, The Philippines. The priest is Fr Falbert San Jose. Please, send this guy a copy of Summorum Pontificum! The headline reads, "Jesus statue's promotion to army general vetoes by Guatemalan president"
A beloved statue of Jesus looked likely to get a promotion to general in the Guatemalan army until the church and president stepped in. The statue, known as Jesús de la Merced, is paraded through the streets of the capital ahead of Easter in centuries-old traditions brought in by former colonial power Spain. Orlando Aguilar, the parish priest in the neighbourhood church where the statue is kept, said in a Christmas Eve mass that on 3 January the statue would be promoted to the rank of general in the Guatemalan army. Local media took up the story and suggested the honour was to be conferred ahead of the 300th anniversary of the blessing of the statue in 2017. But the capital’s bishop was up-in-arms. “Brothers and sisters, as I have said and repeated many times, nobody consulted me about ascending Jesús de la Merced to the rank of general in the army,” Archbishop Oscar Vian said. It would not have been the statue’s first military promotion. During devastating cholera outbreaks in the 1800s, then-president Rafael Carrera gave the statue the rank of army colonel and it was marched around Guatemala in an effort to combat the epidemic. President Alejandro Maldonado said that he had not approved the promotion to general of the statue. “They’re being resettled by Catholic Charities,’’ he said. Dolan said he would not mention their names or ask them to stand. One of the families, he said, was from El Salvador. The other, the cardinal added, is “a Muslim family from the Ivory Coast,’’ in Africa. “Jesus was born into a family that had to flee and become refugees,” Dolan told the congregation. Sorry, Cardinal, but I think this is a bogus comparison. The smallest country in Central America geographically, El Salvador has the fourth largest economy in the region. The oppressed Ivorians are from a country that is a MAJORITY Muslim. See comments abut the Church in El Salvador. But here's the thing that sticks in my craw. To my way of thinking, Jesus was a refugee in a sense that an angel appeared to Joseph and told him to go to Egypt. Why? “Then Herod, when he saw that he was deceived by the wise men, was exceedingly angry; and he sent forth and put to death all the male children who were in Bethlehem and in all its districts, from two years old and under, according to the time which he had determined from the wise men.” (Matthew 2:6). So there was a direct threat to the baby Jesus. And they moved to Egypt and lived happily ever after, right? NO. We all know that the Holy Family moved BACK to Nazareth. Any chance that Cardinal Dolan's refugees will ever return to their native lands? 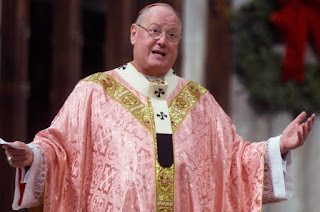 And lastly....what's up with the rose chasuble? On Christmas Eve? NO! Liturgical abuse! 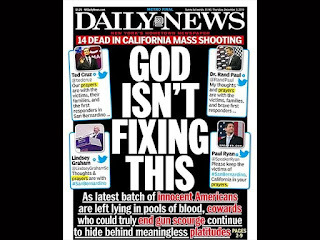 Not really...my guess is the New York Post pulled some stock photo from Gaudete (or maybe Laetare) Sunday and didn't have any Catholics on the staff to correct the mistake. Merry Christmas from the Norbertines! 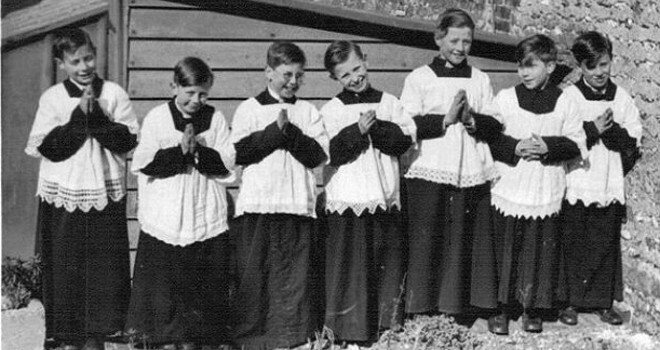 In 1994, the Congregation for Divine Worship issued a letter officially specifying that it is licit for females to serve the altar in the role that has traditionally been known as “altar boy.” Bishops were not bound to permit the practice, and a 2001 follow-up specified that pastors may also choose to reserve altar service to males within their own parishes. 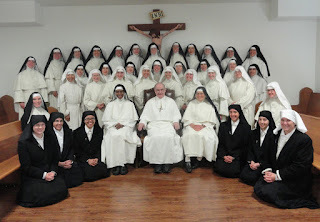 Nevertheless, the Church has specified that altar girls can exist within the Church. The practice is permitted. That doesn’t mean it’s a good idea. Beyond the vocations issue, we come to a more thorny problem. When men are in charge of liturgy, they generally favor austerity, solemnity and reverence. They are far more likely to have “high” liturgical sensibilities. When women claim a more central role, we frequently see a slide into lower and more culturally idiosyncratic practices. It generally starts with campy banners and popular-style hymnody, but may end with synthesizers and scantily-clad liturgical dancers. These liturgies are not beautiful or uplifting. They’re more like a never-ending hug from a grasping, obsequious aunt. Two thousand years ago, around the time that Jesus of Nazareth was born, the second Holy Temple was still standing in Jerusalem. The Great Pyramid at Giza was already 2,500 years old, but the Library of Alexandria was still around. In Rome, the Colosseum hadn’t been built yet. Today, the best scholarly guide to the world Jesus was born into is a man called Strabo. He was born in Amasia, a town in the central north of what’s now Turkey. 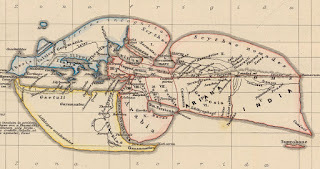 One of the great works of his life was a 17-volume geography, which described in detail the contours, cities and cultures of the world as it was known to the scholars of his time. In this world, the land between the Mediterranean and the Jordan River, modern-day Israel and Palestine, barely rated. 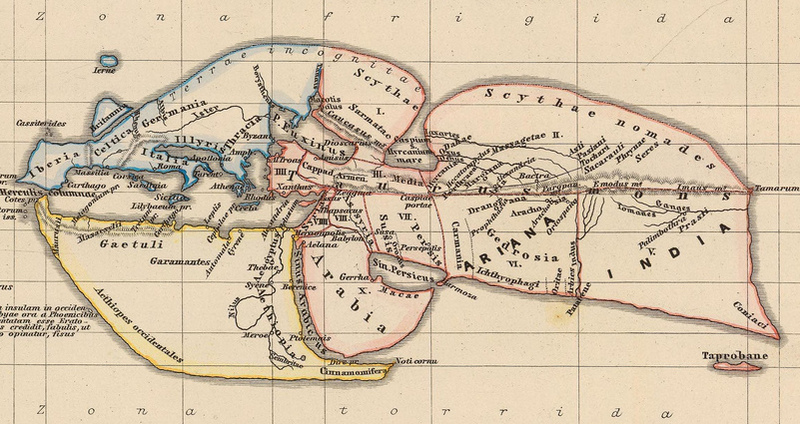 This area was not particularly rich or accomplished, but in the Greek and Roman view of the world, it was strategically situated, providing an overland passage to Egypt. "He easily obtained possession of it, as the spot was not such as to excite jealousy, nor for which there could be any fierce contention; for it is rocky, and, although well supplied with water, it is surrounded by a barren and waterless territory." 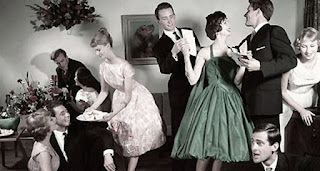 Is it ok For a Traditional Catholic to date a modernist woman he’s trying to convert? 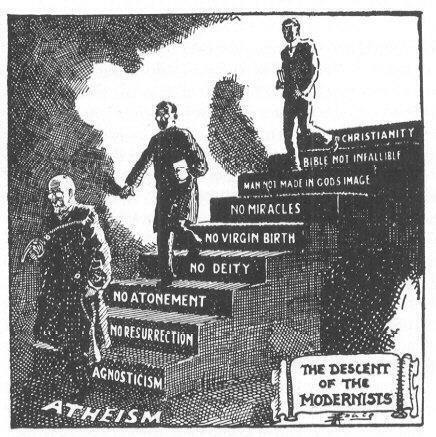 A swift review of Pascendi dominici gregis resulted in no specific pontifical condemnations of the dating of the modernist. As far I can tell, there was no subsequent pontifical legislation that anathematized the practice. Thus, barring particular legislation from the local bishop banning it (which you might have to double-check), in my highly-trained and finely-honed professional opinion, I’d say, go for it! NB: If Miss Modernista begins to quote Loisy or Tyrrell (or the Fishwrap or Card. Kasper), grab your St. Pius X medal and hold up your Garrigou-Lagrange. WARNING: Before things get serious, have her swear the Oath Against Modernism as a condition before your formal engagement, maybe before you even have an “understanding”. 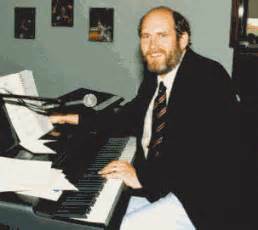 The St. Louis Jesuits, a group of Catholic composers who popularized an Easy Listening/folk music style of church music through their compositions and recordings, mainly from their heyday in the mid `70s through the mid `80s. The group, made up of Jesuit scholastics at St. Louis University, originally used acoustic guitars and contemporary-style melodies and rhthyms to set biblical and other religious texts to music sung in English in response to the liturgical reforms of Vatican II. From the Athens News (I think in Ohio). Read the whole thing. 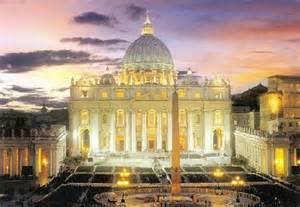 T he most celebrated change brought about by Vatican II was that the Mass could now be said in the vernacular – the languages of various countries; previously, it was said in Latin everywhere. 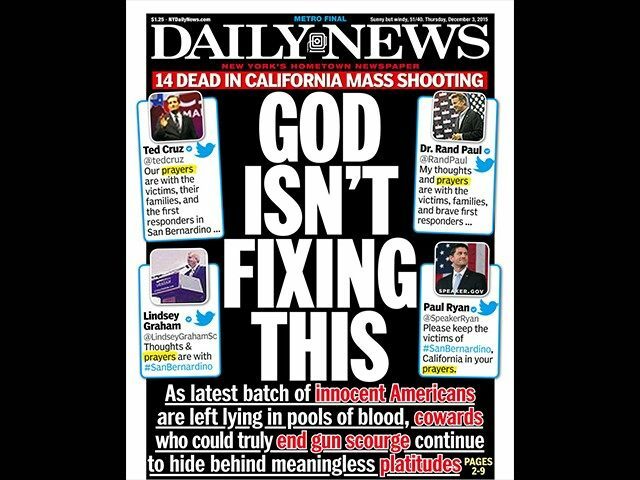 This was taken to mean that it must be said in the vernacular, which was never the case. Modern Mass is conducted as if silence is the enemy, that there should never be a time when there isn’t something noisy going on. Active participation is so encouraged that it sometimes seems as if there isn’t an opportunity to contemplate the mysteries of faith. Even during communion itself, the most fundamental of the seven sacraments, congregants are expected to sing rather than think about how profound it all is. The Latin Mass is quiet, often silent or close to it. The Church teaches (and I think it stands to reason) that prayer must include listening, to hear what God tells us. This is easier to do, especially for easily distracted persons such as myself, when there’s not sensory overload. 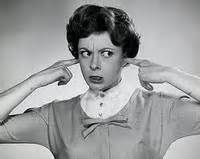 When there is music with the traditional Mass (as Fr. Jonas hopes to institute from time to time, employing seminarians), it is typically in the form of chants that encourage this phenomenon rather than replace it. Modern Mass has in some ways unintentionally come to resemble, say, a PTA meeting. The instant it is over, people are talking and laughing, greeting people across the room, immediately transported from whatever was going on minutes before to the modern secular world. Those who wish to stay and pray must have powers of concentration that far exceed my own. (I am as guilty of these things as anyone else, alas.) The Latin Mass ends in silence, and congregants remain silent; most remain to continue their prayer. The Mass is ended...go in peace! Islamic State (ISIS) has released a chilling video showing their vision of the end of the world as they make more suggestions they are plotting to assassinate the Pope. The video named “Meeting at Dabiq”, shows shows jihadi tanks advancing on an apocalyptic Rome. 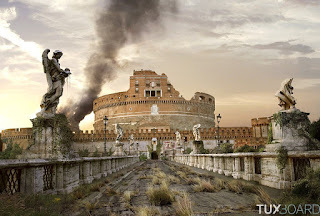 The sinister video, set to chilling music, shows Rome turned to a desert of dust. It features heavily-armoured terrorists approaching the Colosseum and the Vatican City, before the narrator apparently claims ISIS will take over Rome, destroying crucifixes and taking Christian women as slaves. 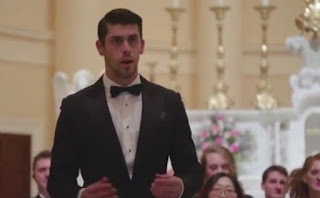 Justin Tucker is a Catholic playing for a team I intensely dislike, the Baltimore Ravens. I'd read the article in the Catholic Review about him, but didn't know the guy could sing. Again, I am having a hard time embedding the video, so copy the link and follow it. Ravens kicker Justin Tucker did not boot his most recent performance. The 26-year-old delivered a stirring rendition of “Ave Maria” at Catholic Charities of Baltimore’s Christmas Concert Thursday night. Tucker, a baritone, began singing opera in college. A recording technology major, he told the NFL Network that he had to take voice lessons as a part of his course load, which is how he discovered his talent. “I’m sure there have been a couple of guys who have played football and sung a little opera on the side,” he joked with Joe Buck. Sam Koch, the Ravens’ punter, told the NFL Network that Tucker routinely sings opera in the shower at the team facility. “It echos through the locker room,” he said. 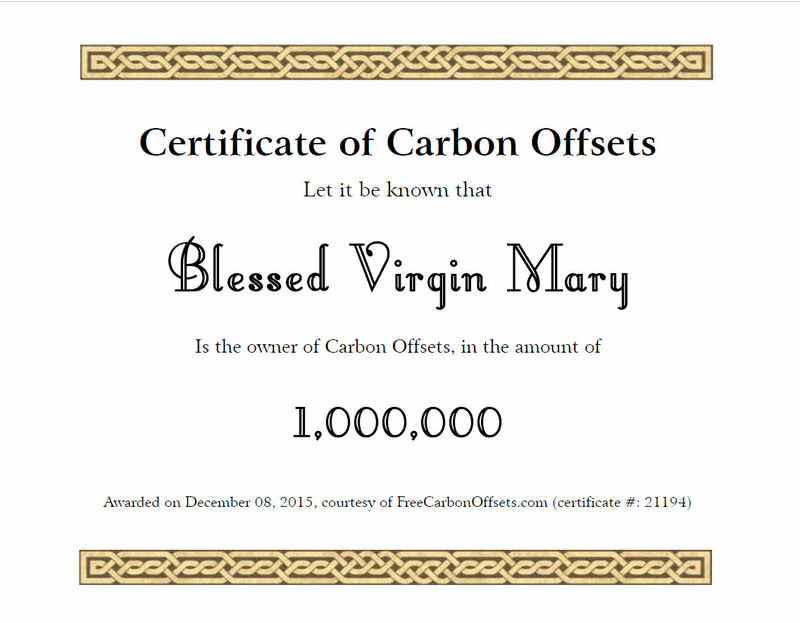 VATICAN CITY, Dec. 4, 2015 /PRNewswire/ -- On Dec. 8, a humanitarian coalition comprised of Paul G. Allen's Vulcan Inc., the Li Ka Shing Foundation and Okeanos, in partnership with The Oceanic Preservation Society and Obscura Digital, and under the auspices of the World Bank Group's Connect4Climate initiative, will present a gift of contemporary public art entitled "Fiat Lux: Illuminating our Common Home" to Pope Francis on the opening day of the Extraordinary Jubilee of Mercy. At this unprecedented and historic event, beautiful images of our shared natural world will be projected onto the façade of St. Peter's Basilica in a contemporary work of public art that tells the visual story of the interdependency of humans and life on earth with the planet, in order to educate and inspire change around the climate crisis across generations, cultures, languages, religions and class. 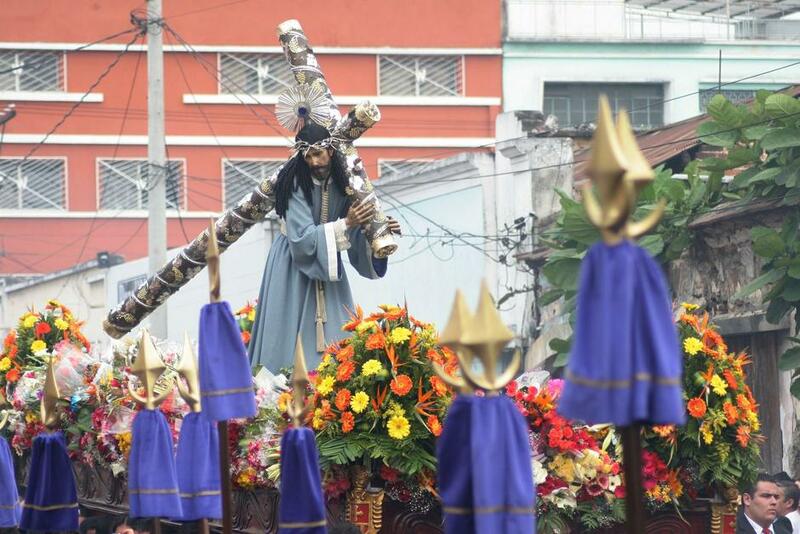 And to do it on THE SOLEMNITY OF THE IMMACULATE CONCEPTION??? 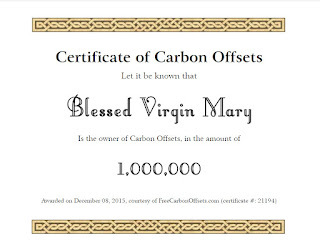 Was Mary born without a carbon footprint? Four people have been arrested over alleged threats made by jihadists to kill Pope Franics. The arrests, made in Italy and Kosovo, were conducted by anti-terror police who had been monitory a "highly dangerous group" on social media. All four were Kosovan nationals said to have links to Syria. 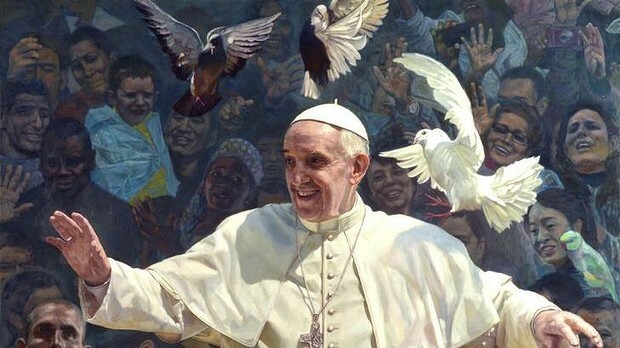 Police said threats had been made warning Pope Francis "would be the last Pope". There were also threats made against the ex-US ambassador in Kosovo and praise for the Paris terror attacks which left 130 people dead. The arrests followed raids in the Italian cities Brescia, Vicenza and Perugia as well as Kosovo. Police said "the [alleged] terrorist team propagated the ideology of jihad through social networks". The alleged 'ringleader' of the group is believed to have lived in Italy before being arrested in Kosovo. A Roman Catholic diocese has taken down the Facebook photo of a nun with a 10-point buck she bagged after the posting drew criticism, some of it vulgar, by anti-hunting and animal rights activists, the diocese said. 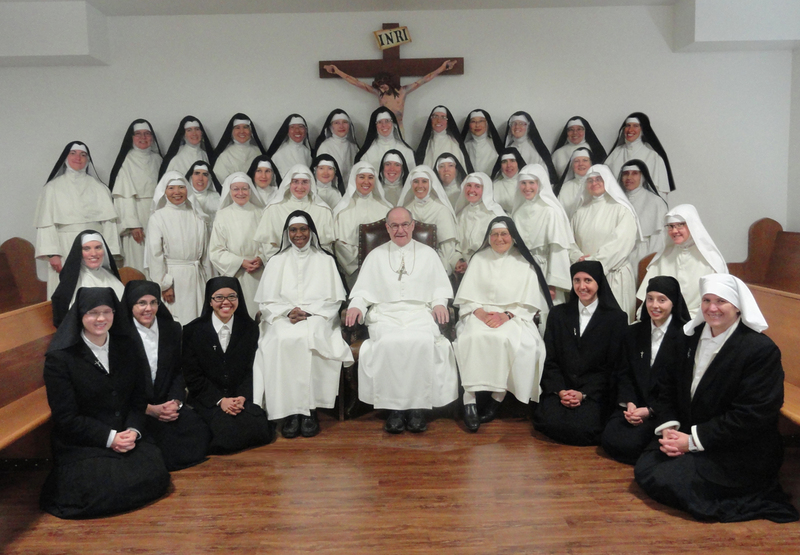 Sister John Paul Bauer killed the deer on Nov. 30, the first day of hunting season. 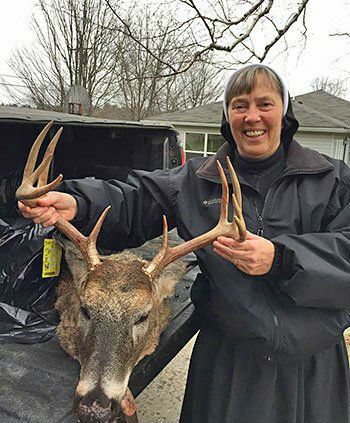 The photo posted on the Erie Diocese’s Facebook page showed her, in her nun’s habit, at the back of a pickup holding her trophy deer by the antlers. Initial comments were largely positive, Anne-Marie Welsh, spokeswoman for the Erie Diocese, in northwestern Pennsylvania, said Monday. But as the page neared 1.5 million views, animal rights activists began taking offense, she said. As Father Z says, "Dear Lord, send us more priests like Fr. Murray. Mary, Queen of Priests, defend all priests with your mantle and ask Your Son, the Eternal High Priest, to give them courage to speak the truth with clarity and mercy." 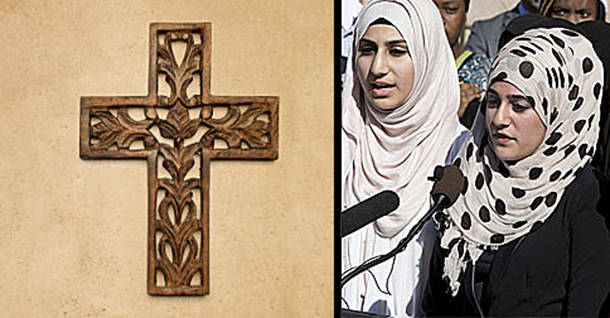 A complaint that says crosses at Catholic school are “offensive”, and prevent Muslim prayers, has been filed against Catholic University in Washington, D.C. 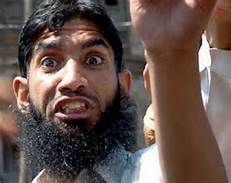 It is only the latest in an endless series of demands for Sharia Law adherence by Muslims in America. Baffled Catholic University officials say they have never received a complaint from any of the schools Muslim students, but in fact, a prior complaint from active students is ongoing (see Hannity video below).